Mazurek, also known as mazurka, is a flat Polish cake made with yeast or non-yeast doughs and topped with any combination of almond paste, preserves, dried fruits, nuts, meringues, and sometimes left plain. The one thing they have in common is they are rarely over 1 inch in height. A mazurka also is the word for a Polish folk dance, a country sparrow and someone from Mazur in North Central Poland. Traditionally served at Easter, this pastry is so delicious and easy to make, it now appears at tables year-round. By hand, stir in almonds, zest, flour, making sure to measure flour correctly, and hard-cooked egg yolks. Add raw egg yolk, salt, and cinnamon, and mix into a smooth dough. This entire process, from step 1, can be done in a food processor, if you prefer. Place dough in plastic wrap and refrigerate for at least 30 minutes. Cut off 1/3 dough and return, wrapped, to the refrigerator. Roll out 2/3 dough and place on an 8-inch-by-11-inch tart pan with a removal bottom or a small sheet pan. Pierce or "dock" the dough with the tines of a fork. Using pastry brush, egg wash (1 beaten egg with 1 teaspoon water) dough. Roll remaining 1/3 dough and cut into 1/4-inch strips. Arrange strips lattice-style over dough. Brush lattice strips with egg wash.
Bake for 20 to 30 minutes, or until light golden brown and crisp. Allow to cool completely. 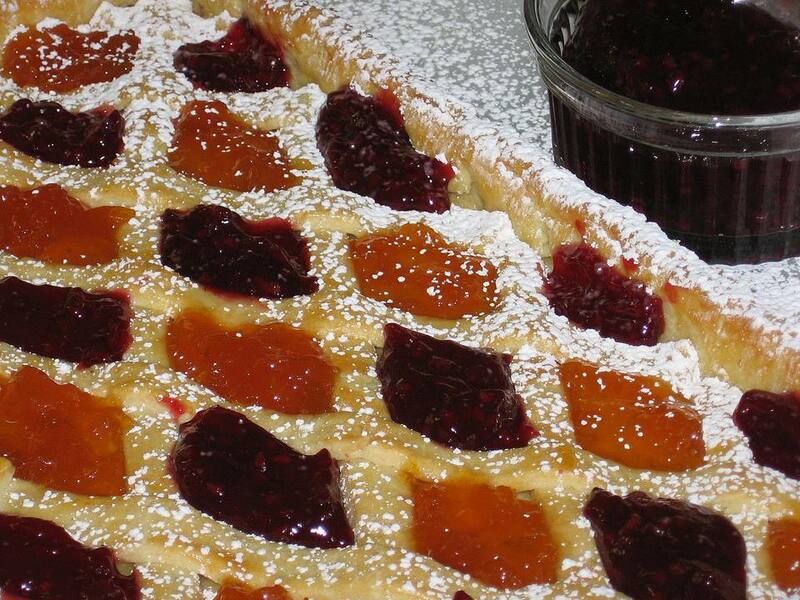 Place pastry on a serving plate and spoon fruit preserves alternately into the open spaces of the lattice work. Sprinkle lightly with confectioners' sugar. This can be a difficult dough to work with for some, but it is a traditional recipe. This pastry dough is not meant to be like pie dough. It is delicate and takes a little coaxing, but the flavor is definitely worth it.